Medium sized body (queen 19-21 mm, workers 10-15mm, males 13-15 mm), with a short head. Body is primarily back with yellow bands. Yellow bands are found across the body in front of the base of the wings, on the second and third segments of the abdomen, and a fringe of brownish-yellow on the fifth segment of the abdomen. 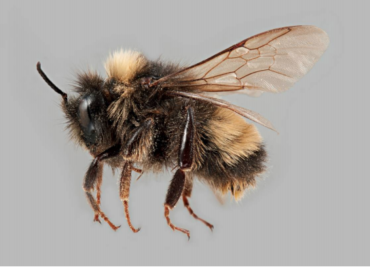 Bumble bees have three adult forms: the queen (reproductive female), workers (unmated daughters of the queen that usually do not reproduce) and males. Live in colonies with one generation per year. In late summer, reproductive bees (males and new queens) are produced. These bees will leave the colony and mate. Queen bees live for just over a year. They are the only bee in the colony to hibernate and do so after mating. Overwintering occurs underground or in decomposing organic material such as rotting logs. 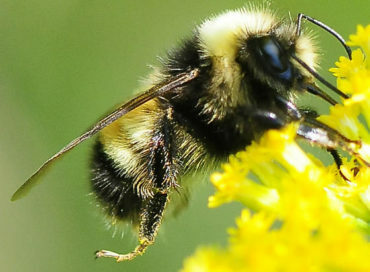 The yellow-banded bumble bee is a habitat generalist, using a variety of nectar sources and habitat types as long as flowers and nest sites are available. Nest sites are found either underground in abandoned rodent burrows or above ground in decomposing logs. Plant a variety of native flowers and shrubs in your gardens that bloom from early spring to late fall. Take a look at our Best for the Biosphere suggestions! Consider waiting until other flowers are abundant in your garden before mowing your dandelions, they are one of the few sources of nectar and pollen for queen bumble bees in the spring. Submit observations to citizen science projects, such as Bumble Bee Watch. Learn more about conserving pollinators!